21148 PCA SKIN Hydrating Serum, 1 fl. oz. A novel serum containing a specialized blend of antioxidants and moisture-binding ingredients to leave skin soft and ultra-hydrated. Essential for dry skin, yet beneficial for all skin types. 21146 PCA SKIN Anti-Redness Serum, 1 fl. oz. This calming formulation soothes and improves the appearance of sensitive and sensitized skin prone to redness. 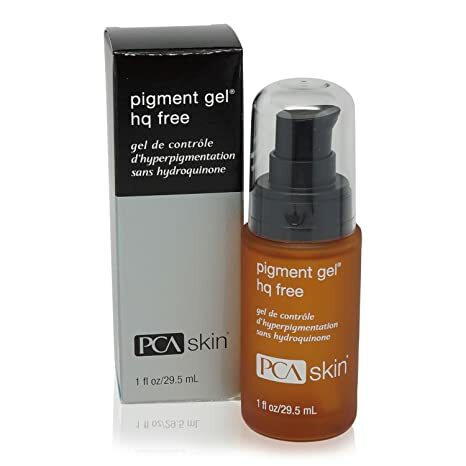 PCA Skin Pigment Gel HQ Free (formerly Pigment Gel HQ Free – pHaze 13) features a hydroquinone-free formula that diminishes age spots and discoloration for a radiant complexion. An exfoliating complex of lactic, kojic and azelaic acids refine and smooth the skin while diminishing hyperpigmentation. Glutathione and tyrosinase inhibit melanin production to prevent new dark spots from forming. 21179 PCA SKIN Intensive Age Refining Treatment 0.5 Pure Retinol Night, 1 oz. Specifically formulated for aging, this advanced retinol formula features a delivery system often used in pharmaceuticals, yet entirely new to skincare. The patented 10-hour time-release OmniSome delivery system stabilizes and carries a unique blend of ingredients deeper into the skin for superior results. This innovative formula minimizes the appearance of fine lines and wrinkles, and reduces age-related skin yellowing. This antioxidant formulation delivers stable and maximum strength 20 pure vitamin C and 5 pure vitamin E to protect skin from damage, strengthen and smooth the skin, and fight the visible signs of aging. 21147 PCA SKIN Retinol Renewal With Restorative Complex, 1 fl. oz. 21140 PCA SKIN A&C Synergy Serum, 1 fl. oz. This astringent serum promotes a clear, even complexion for those with oily, breakout-prone skin. An at-home clay-based treatment mask that exfoliates, detoxifies and removes impurities, leaving skin smooth, clear and bright. A well-balanced botanical blend to promote a clear complexion Clay-based mask that eliminates built-up impurities in pores Micro-fine pumice to gently exfoliate built-up surface debris Active Ingredients: Algae detoxifies and hydrates the skin. Clay detoxifies, and absorbs oil and impurities. Pumice gently exfoliates built-up surface debris and impurities from the skin. Tea tree leaf oil promotes a clear complexion. Directions: Apply a thin, even layer over entire face (neck and chest also recommended). Leave on three to five minutes. Remove mask with warm water and gentle circular motions to activate pumice for increased exfoliation. Pat dry and follow with the appropriate PCA SKIN moisturizer in the evening. Use once a week or as needed. Formulated with Beautiful Skin in Mind Our products are scientifically developed and carefully formulated to improve the health and appearance of your unique skin. We understand the importance of formulating with the best combinations of innovative ingredients to provide you with safe, highly effective products that deliver on their promises. All of our products are free of potential irritants like synthetic dyes and fragrances. PCA SKIN does not perform or condone animal testing. This cutting-edge eye cream strengthens, firms and lifts the skin around the entire eye area. This unique formulation utilizes the latest science, combining proven ingredients in a single formulation that can be applied directly to all areas around the eye, including the eyelid, to treat all the common concerns of the aging eye area. 812025016924 PCA SKIN Hyaluronic Acid Boosting Serum, 1 oz. Plump and firm skin through increased hydration with this advanced hyaluronic acid formulation. This smoothing blend provides deep, long-lasting hydration on three levels: on the surface, deeper in the skin and by increasing the skins own hyaluronic acid production. 13739 PCA SKIN Body Therapy Lotion, 7 oz. This therapeutic full body moisturizer hydrates the skin and encourages a clear, even skin tone and smooth surface texture.Lactic acid (12) found in milk and sugars, this ingredient moisturizes and smooths the skin.Shea butter softens the skin and maintains moisture without greasiness.Sodium hyaluronate holds 1,000 times its weight in water, playing an important role in skin hydration. 21180 PCA SKIN 0.5 Pure Retinol Night Intensive Clarity Treatment, 1 oz. 21411 PCA SKIN Total Strength Serum, 1 fl. oz. A next generation peptide blend with epidermal growth factor and a host of beneficial extracts to minimize the appearance of pores, fine lines and wrinkles. 21164 PCA SKIN Perfecting Neck & Décolleté, 3 oz. This unique corrective cream is specifically formulated for the delicate skin on the neck and chest to strengthen, firm and minimize redness and skin discoloration. This unique corrective cream is specifically formulated for the delicate skin on the neck and chest to strengthen, firm and minimize redness and skin discoloration. Designed specifically to target sagging, loose skin, and lines on the neck and chest. Dramatically hydrates and reduces redness and discolorations. Rapid results in as little as one week.